Non-invasive suction excavator technology is ideally suited for excavation work on job sites where existing buried pipe, cable and other utility lines are present. When a utility is struck and damaged using conventional techniques there is the disruption to the supply, lost revenue, negative publicity and customer service issues. For a contractor there are serious cost implications, job overruns, and the potentially irretrievable damage to its relationship with the client. Above all utility strikes can injure operatives and members of the public. Sadly, in some cases, utility strikes can kill. All responsible contractors insist that site teams locate underground utilities and check plans before excavating but it’s an inexact science and mistakes still happen. Suction Excavator Solutions therefore provide an alternative safe digging method to mechanical and manual excavation techniques. Suction excavators are over six times more productive than manual excavation methods even in heavy soils where pipes and cables are known to be buried. Utilities companies can achieve faster repair and service connection times; contractors are able to schedule work more accurately because site logistics are simplified. Whilst safety is paramount, suction excavation also provides users with a host of further operational and safety benefits. 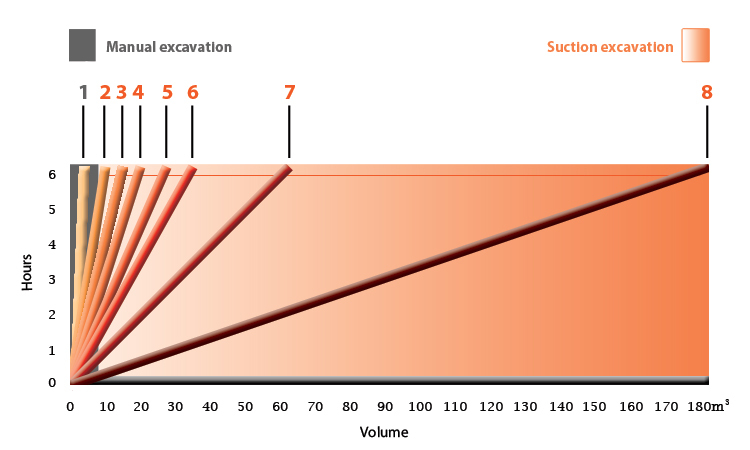 The suction excavation process can be finely controlled and the size of the excavation and the volume of material removed are therefore minimised: less excavated spoil means less environmental impact and reduced reinstatement costs. Keyhole excavation produces a neater finish and less of the highway is lost to excavation therefore reducing traffic disruption. This is an ideal solution in town centres and cities and is welcomed by local authorities. The speed and flexibility of the suction excavator is ideal for works in high-profile locations and for works in the vicinity of sensitive structures. Urban sites are often complicated by restricted and difficult access. The suction excavator’s telescopic reach and flexibility means it can be effective in many areas where mechanical excavation is compromised. Labour intensive manual excavation work that is often associated with health and safety risks is fast becoming a thing of the past. No man entry required into the excavation reducing many health and safety risks thus reducing personal injury claims. Suction Excavator SolutionsWhy use suction excavation?